Mary Martha or Martha Mary? A school friend of mine, who spent most of his childhood in Roman Catholic parochial schools in the 1950s, once jokingly remarked to me that it was not until he was a teenager that he learned that all girls were not named either Mary Martha or Martha Mary! Both of these women have places in our liturgical calendar and are honored by the church. We know they were sisters of Lazarus of Bethany, and by all accounts were two of Jesus’ closest friends. From the earliest days of the church, biblical commentators have viewed them as embodying two opposing types or models of faithful Christian women. 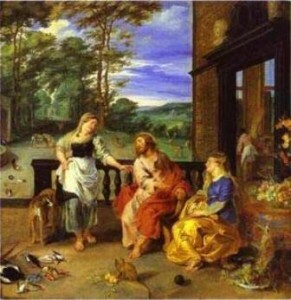 Martha, the activist, always scurrying around taking care of all the chores; and Mary, the contemplative, who, much to her sister’s irritation, neglected the housework to sit at Jesus’ feet. Whenever I hear this story, I think of two of their real-life namesakes who were parishioners of mine. One, Martha Davis, was the wife of a priest who worked with me at St. James’ in Los Angeles. Martha was a nurse by training and was the consummate care-giver. She opened her house to a constant stream of visitors who could be sure they would never leave hungry. Martha loved to cook and also loved to eat, especially while watching pro-basketball games on TV. She was also the co-director of the altar guild and was a force to be reckoned with. Martha had no patience for liturgical experimentation, which she referred to as “monkey business.” For Martha, worship was to be finished as quickly as possible so she could get back to work. Then there was Mary Abbott. Mary was younger than Martha and of a completely different temperament, even though the two were friends. Mary sang in the choir. Her voice was not professional, but that was not why she was there. For her, singing was a form of prayer, a way to glorify God. I could always count on Mary to be present at Bible study and worship and to ask deep and thoughtful questions. If Martha was always to be found in the parish hall kitchen, Mary was equally likely to be found in the church sanctuary. Mary and Martha, like the women in the Bible for whom they were named, represent two different expressions of spirituality, and not only for women. There has always been a dichotomy between these two kinds of Christians, between the monk and the caregiver, the prayerful introvert and the fellowship-hall extrovert, the meditative and the active Christian, the parishioner who likes Gregorian chant, candles and dark Gothic spaces and the one who prefers the bright lights, upbeat singing, and big crowds of a mega-church. Episcopalians tend, on average, to be Marys, while Marthas are more likely found among the Baptists. But whatever the denomination, I suspect that most of us tend toward one type or the other. Some of us are Marthas who are the caregivers and who volunteer for every church activity and program, while others, the Marys among us, would rather be left alone in a quiet nave or Bible study class. The point of the story, however, is that Jesus loves both types. True, he tells Martha that Mary has chosen the “better part” by electing to sit at his feet, but he makes it clear that he loves them both and that both their ministries are important and valued. I would like to suggest, with some trepidation, that the church has been guilty of forgetting the need for this balance and that it has, through most of its history, tried to keep Mary and Martha apart, especially in its treatment of women. And so the result has been not only to deny the feminine nature of God and of the Spirit, but it has also been to push women over to the Martha side, denying that they could possibly know anything about the nature of the Spirit, study theology or serve as clergy. What they were good for was church housekeeping or taking care of those who, like them, had no power or money. It was OK for a nun to care for the sick or to teach school children, but not to teach “seminary.” It was acceptable for women at the church to sew quilts, teach Sunday school or to stand at the stove and make cakes for the bake sale, but not to stand at the “altar.” It was fine for them to be Marthas, but the “better part,” the Mary part, “that” was for men only. 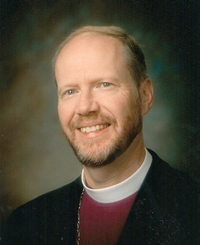 In the Episcopal Church until just 30 years ago, it was fine for women to be active on the ECW but not on the vestry, diocesan convention, or even to read the lessons on Sunday morning. They could teach children in Sunday School, but not adults. Again, both Marys and Marthas are needed. Jesus could not do without both his friends, and the church cannot exist just with contemplatives or just with activists.